Robots will become cheaper and more efficient in the coming years, replacing human workers at a faster clip than expected while driving labor costs down by 16 percent, according to a new report. 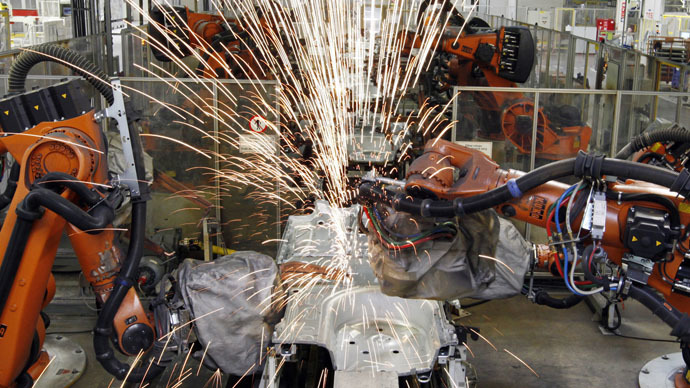 The number of industrial robots will jump by 10 percent a year in the world’s top 25 export nations through 2025, according to the Boston Consulting Group’s report, “The Shifting Economics of Global Manufacturing.” The current growth rate is about 2 or 3 percent per year. The abundance of robotic workers will slash labor costs by 22 percent in the United States, 33 percent in South Korea, and 25 percent in Japan. “As labor costs rise around the world, it is becoming increasingly critical that manufacturers rapidly take steps to improve their output per worker to stay competitive,” said Harold L. Sirkin, a senior partner with Boston Consulting Group. By 2025, machines will assume more than 23 percent of jobs that could be automated, the group predicted. Currently, only 10 percent of jobs robots could do are actually done through robotic technology. The costs to own and operate robots will fall, as well. For example, a robotic spot welder that was $182,000 to maintain in 2005 now costs just more than $130,000. In 2025, that cost will fall to $103,000, the group said. Robots are also expanding their abilities based on advances in “vision sensors, gripping systems, and information technology,” the group said, allowing for new frontiers in automated industrial applications. “For many manufacturers, the biggest reasons for not replacing workers with robots have been pure economics and technical limitations,” said Michael Zinser, a Boston Consulting Group partner. The group said that with advanced automation, manufacturing companies will "no longer simply chase cheap labour,” which could mean renewed interest in manufacturers relocating back to the US from lower-wage nations, for instance. But eventually, fewer people will be employed in the long-run, as only highly skilled positions will remain. Boston Consulting analyzed 21 industries in 25 nations last year to develop its predictions.